We decided that myself and the missus would try camping and at nearly 43 this will be the first time I have been camping in about 30 years and the missus in over 20 years, so this is really a new experience for us. The reason we decided to go camping is normally once a year we go on a family holiday with our 15 year old daughter, this is normally on holiday parks like Haven, Pontins, Park Resorts etc. As these holidays give us a bit of entertainment on the evening. This year we went to Thorness Bay on the Isle Of Wight and on the last night we played the cash bingo and I won £160, and decided instead of just spending that money normally we would buy something out of it. 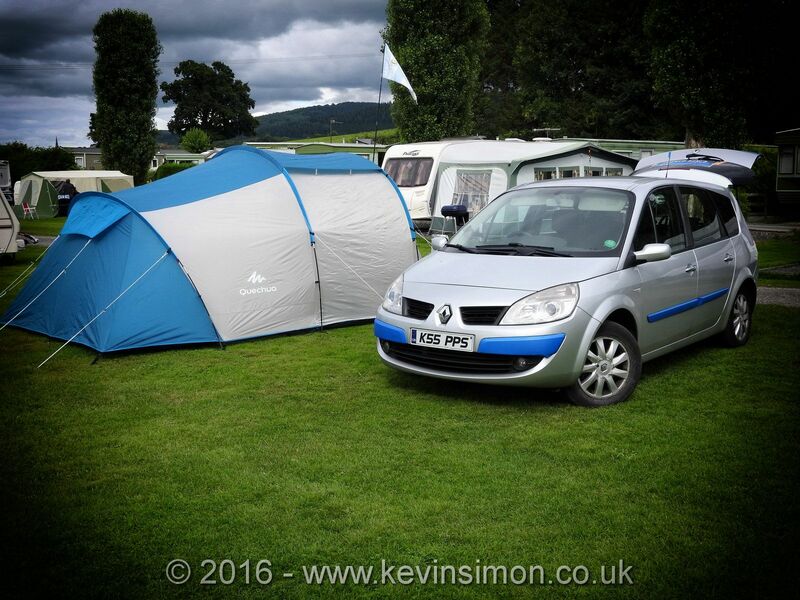 We had wanted to get away for some short breaks throughout the year also, so decided using the money to get a tent. 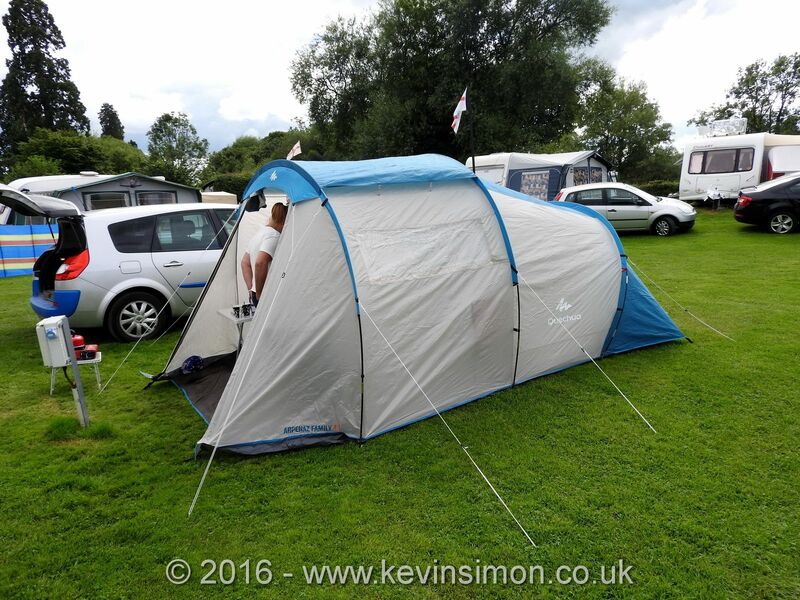 Having looked around at all different tents as we didn’t want to spend too much money on a tent if we didn’t get on with camping in the end decided on the Quechua Arpenaz 4.1 Family tent, which sleeps four people in one room. We got ours from Decathlon for £79.99, but have seen it from other retailers. We did look at the next 4 man tent up from this which had the main entrance and two sleeping one either side, though the pods did seem a bit small. The missus is a bit claustrophobic, so this didn’t suit and any way the tent is really only for the two of us as our 15 year old daughter didn’t want to come camping. The other main requirement I wanted in a tent is to be able to stand up, I’m 5′ 11″ and this tent can easily stand up in the living compartment and just about in the bedroom compartment. We also got the essentials from one of the discount stores as the missus works for one of them , so we got a double air bed £10, Camping Stove £10, Gas canisters four for £4, Foldable camping table £10, 2 foldable chairs £9 (for both), Battery mini lanterns £3 and the main essential a whistling kettle £5, as the missus needs her cups of tea 🙂 So the essentials we need and the c=tent cost just over £120 which really isn’t bad. For the first time of camping we went to a caravan and camp site Severn Caravan Park just outside of Whelshpool, Wales. This is a park that neighbours of my Mon have a static caravan there and my Mom goes up with them sometimes so we went the last weekend in July, as at this time they were there and my mom, so thought would be nice to try out on a site that we know and if we got stuck there would be help there as well. We set out from on the Friday evening after the missus finished work at 6pm and got to the site at around 7:30, after a quick chat with my mom and friends we started to set the tent up. We had a pitch that does have a electric hookup but didn’t use it as we had enough for us to be off grid. The cost at this caravan park for a pitch per night is only £12 if use the electric hookup then an extra £3 per night. Putting the tent up for the first time was pretty easy, first was to layout the tent insert the three poles one which is colour coded then peg the front of the tent down then put it up from front to back, so really simple even for us that haven’t put a tent up in years, then all that was needed was to secure the guide ropes and clip in the sleeping pod and living pod ground sheet, took us about 30mins which really isn’t bad considering we had to refer to instructions and work it out, so I would say the next time should take us half that. As this is our first time camping for food it was easier to goto the local chippy instead of cooking and also needed beer 🙂 After that we blew up airbed, only had a foot pump but really didn’t take that long (though will invest in car powered air pump) for bedding we had taken our king size 10.5 tog quilt and our own pillows. 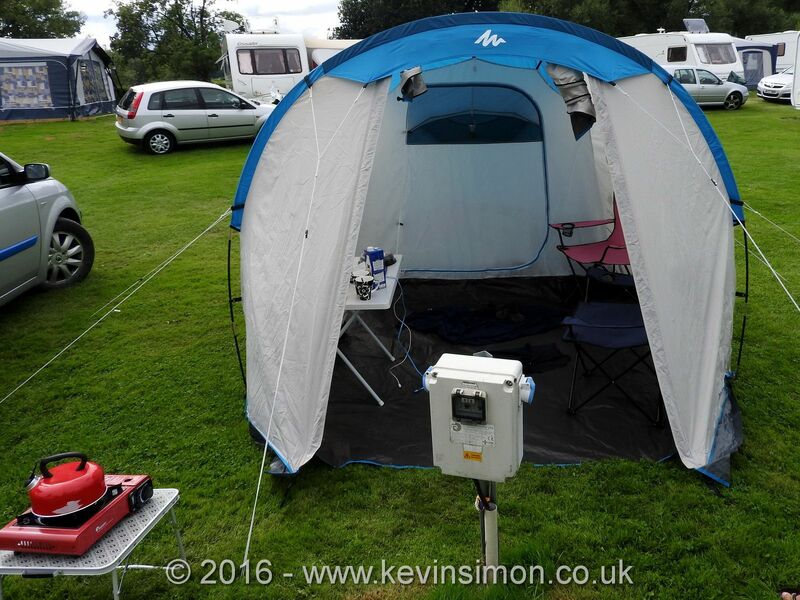 As on the site there isn’t a pub etc, we had drinks in the tent and I had downloaded some TV shows we wanted to catch up on, we had our tablets so the hudl 2 with an 8.3″ screen was ok for watching the tablet using little stand on the table. Was nice and cosy, as was warmish that evening, though when got dark as we were by the main track as people went by there shadows could be seen in the tent, I remarked something like in a horror film 🙂 . The toilet and shower block was less than 100 yards from our tent, so was ok if needed the loo. Sleeping in the tent was ok, though the airbed did feel a bit hard for us, as use to a softish mattress. In the night I did find it a little chilly, though the missus was ok, that’s more for some reason I feel the cold, the temperature in the night was about 10-12 degrees c. The tent does let light in as not really that dark material so first thing in the morning does get bright early in the tent, though im always awake early in the morning. After getting up and rushing to the loo block, too much beer I think 🙂 I set the mini gas stove up outside to make a brew, and I have to admit was really nice sitting in the living compartment with the front flap up with a nice coffee for me a tea for the missus. For us camping our idea is not really to stay on the site, we like exploring the area that we are in and as we are National Trust members we can visit any of the hundreds of attractions around the UK. So on the Saturday we went out to Powis Castle. We got back to the site around 4pm, so time to relax, again not prepared for cooking we went to a nice pub in Whelshpool (Smithfield bell) and what a lovely meal it was. after that we decided to go to the local pub about a5-10min walk from the site (The Square and Compass) which is a quiet local pub, was nice just to relax and chat with a pint or two. When we got back about 10ish, we carried on catching up on our TV shows. This night did seem a bit warmer than the previous though the temperatures were about the same, though the tent did get the sun all day so may have retained a bit of heat. So we did have a more comfortable nights sleep, as also we did let some air out of the air bed to make it bit more softer. The next morning packing up the tent was really easy, though why is it doesn’t always go back into the bag properly, though the bag does have a bit of extra room so did just about get in back in. After saying our goodbyes we then went to Chirk Castle, in Wrexham. We both did really enjoy the camping experience though when we do it again, which we will be doing other weekend breaks we will take some extra things. First a thicker quilt, I know you can get sleeping bags, but both myself and the missus don’t like being restricted in movement. The main extra thing I need to take is slippers as I only had my trainers so when in the night and need to go to the loo, it is a pain to try to get your trainers on. Also dressing gowns for both of us so again when going out of the tent at night don’t need to be fully dress and just put dressing gown on. The power on our tablets did last the weekend, though I will be getting a high power rechargeable battery pack that can power our electronic devices. As I know you can have the electric hook up but we want to be able to do the camping really off grid, so that we don’t always have to find camp site that do have electric hook up points. I also think thicker clothes just in case the weather do get a bit colder. As this was our first time camping we was prepared, but just those extra things would really help out. We wasn’t to sure what to expect, but was an enjoyable experience and a nice short weekend break. The next time we will try cooking on the little stove instead of going out for something to eat, though the main thing we need is mobile reception as where we were stopping our mobile signal was low, and no internet, so not good for me as cant update the blog while i’m away as want to keep adding to the new section to this site following the adventures of various Lego min figures :-). So if there is anyone thinking of camping for the first time my suggestion is go for it, as really not that expensive, as you can see for the needed equipment we got the majority of what we needed for just over £120 which really isn’t bad and at just over a tenner per night on the site we was on isn’t bad at all. As we went the last weekend in July not to sure what we would be like ion the colder weather but will be updating the next time we go.